American Horror Story: Hotel closes out what is the series' fifth season with the uncharacteristically bright 'Be Our Guest.' While many finales in the anthology have ended with notes of happiness or, at the very least, a sense of peace achieved through struggle and compromise, none have felt as oddly uplifting and so thoroughly interested in crafting a sense of optimism that is mostly unearned and yet appealing nonetheless. Its approach to the end of what was another typically messy, at times incoherent batch of episodes is with the same stylish superficiality that has defined the series from its inception. And yet, even in the sameness of its spectacle, there was something in the last hour that, while it didn't entirely add up, somehow felt engaging. In many ways, 'Be Our Guest' – and all of Hotel, really – resembles the climax to the series' first season, in that the family of the Murder House eventually find themselves in an unexpectedly harmonious place, garish as it was. There was a sense that the Harmons had finally achieved a level of acceptance amongst one another and, to a certain degree, the denizens of the house that was to be their home for eternity. While the Hotel season approached, grabbed, and ran away with a number of themes and ideas during its run – often times within minutes of one another in the very same episode – the finale seemed to zero in on this notion of acceptance as the one idea it would like to play around with until the end credits appeared on the screen. 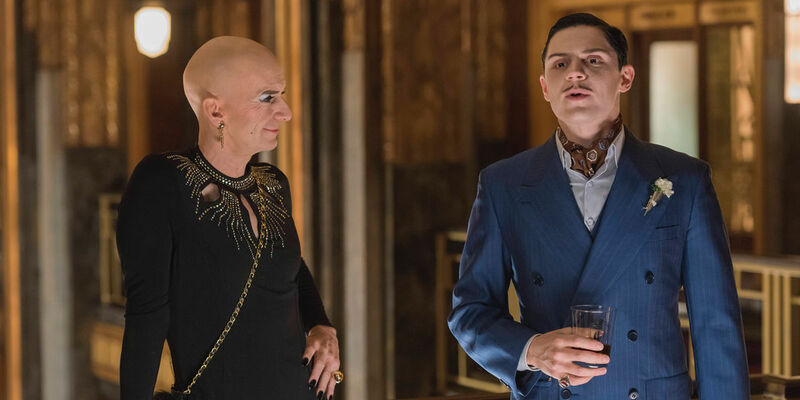 In fact, it even has Denis O'Hare's Liz Taylor – who not only found herself shifted to protagonist for the majority of the hour, but, in the show's own rapid fire way, was promoted to den mother of the off-the-books residents of the Hotel Cortez – refers to the place as a "beehive of acceptance," just in case the show had suddenly become too subtle. As with most things about American Horror Story, this fixation on the idea of acceptance feels like the word was picked out of a hat and the lucky writer – in this case, John J. Gray – just had to run with it, sort of like a dare. In other words, there's little to suggest this was the intent of the season as a whole, but rather just sort of how things shook out. But feeling as though the show has no concrete idea what it's really about is, by now, part and parcel to the viewing experience so many of us submit to each and every year (and soon, twice a year, if Ryan Murphy's threats to double up on AHS are to be taken seriously). For his efforts, Gray manages a to keep things relatively coherent, despite the episode's need to cram in everything. Things naturally get chaotic along the way, some characters are given short shrift in bizarre fashion, while others, like Hypodermic Sally wind up with a brief tangent of a story line that the episodes slips in and then out of so succinctly, there's barely time for it to register. That's probably for the best, given that Sally is able to overcome her crippling loneliness and addiction to heroin by casting herself into the healing light of social media. You might think Murphy & Co. would suggest that Sally's just trading one addiction for another, and that, rather than injecting poison into her veins she's leaping headlong into the noxious human abyss that is the social media triumvirate of Facebook, Instagram, and Twitter, but no, the exchange feels genuinely optimistic, like somehow some good was done – from the point of view of AHS, anyway. The episode's sometimes superficial haste in correcting all that's wrong in the lives of the living and the dead finds its zenith in Liz's story and her narration, explaining how she and Iris reimagined, renovated, re-opened the Hotel Cortez, transforming it from a hellmouth of evil and death into "a family to the friendless, a comfort to those in the cold" and, finally "a beehive of acceptance." There's a sweeping sense of course correction, and that everything for these characters will be alright, now that Liz's maternal instincts have kicked in and, with the help of the suddenly pragmatic James Patrick March, they can all do their part to ensure the Hotel Cortez is still standing by 2026, so that it can achieve historic landmark status and ensure they have a home within its labyrinthine halls. Much of this is due to O'Hare's performance, which is probably the best the show had to offer this season (though Peters was tremendous as well). Kathy Bates, Sarah Paulson, and Angela Bassett all gave typically great performances, but those felt at times like extra effort heaped onto mostly surface-level characters whose depth was often hinted at but never fully explored over the course of the season. It's telling that Paulson was best able to shine when revisiting her character of Billie Dean Howard, the psychic from season 1. But it's O'Hare who the finale chooses to focus on and of the many, many choices the series makes from one second to another, this one feels most right. All of Liz's voiceover is really just lead-in to what is her end, which is in keeping with American Horror Story's love of excess and the episode's idea of acceptance. To have her death come in the presence of those she has come to think of as family, and to be ultimately delivered into an eternity in the Cortez by the Countess is about as close to lyrical as this show is ever going to get. Of course, almost right on cue, the show cranks the wheel for a tonal 180 and winds up crashing into the misanthropic nadir of John Lowe's return to the Hotel Cortez for Devil's Night. Of all the choices Hotel made in its finale, the tenor of this segment felt out of synch with the rest of the hour. Some of it has to do with John's story being summed up in a mixture of flashback and voiceover, like Liz's was, but more of it was the way the story felt compelled to service the character of Billie over John's family. After Billie is scared out of the hotel for good (no more Devil's Night TV specials on Lifetime), John retires to his room to find his now older daughter waiting for him while Alex and Holden sleep. This is the short shrift mentioned earlier. While Wes Bentley is finally given a chance to loosen up and not be such a comically deadpan caricature – his flirting with Lily Rabe's Ailieen Wuornos is maybe the most alive the character has felt all season long – Chloë Sevigny doesn't get so much as a line of dialogue; she doesn't even open her eyes. And again, this shows how often American Horror Story just seems to fly by the seat of its pants when it comes to developing characters and their storylines. Still, for all its inconsistency, Hotel had more than a few brief flashes of inspiration – an exploration of addiction and grief, or the loneliness that comes from feeling unaccepted by those around you – but, as is almost always the case, Hotel found itself easily distracted by the shiny new thing glimmering in the corner – i.e., Lady Gaga. As a result, the story often felt scattered and rootless, given to bits of stylistic exuberance in search of a foundation on which to plant some larger meaning. American Horror Story: Hotel didn't quite find that here, but it did a better job of searching than in the last two seasons. American Horror Story will continue with season 6 in the fall of 2016.